Ludwig-Maximilians-Universitaet (LMU) in Munich researchers have characterized the physical mechanism that enables a widespread bacterial pathogen to adhere to the tissues of its human host. This feat was made possible by the novel two-pronged approach used in the study. The researchers utilized atomic force microscopy to measure the binding force between a staphylococcal adhesion protein (SdrG from Staphylococcus epidermidis) and its cognate ligand (fibrinogen β) at the single-molecule level in vitro, and calculated the contributions of all of the atoms involved in the interaction in silico, with the help of an especially powerful supercomputer. "This innovative paradigm yields insights that were previously unattainable," Gaub points out. In order to dissect the adhesion mechanism, the Blue Waters supercomputer at the University of Illinois, with its 900,000 processors one of the most advanced in the world, carried out detailed molecular dynamics simulations. The tenacity of the interaction surprised the team. "The mechanical binding force that keeps the components of a single complex together amounts to more than 2 nanonewtons (nN). This is an extraordinary value for a non-covalent interaction, comparable to the strength of the covalent bonds between atoms, which are the most stable molecular bonds we know of," says Gaub. The study shows that, thanks to the geometry of the interaction, the adhesion protein forms a dense network of non-covalent hydrogen bonds with its ligand. Moreover, this network is mediated by the peptide bonds that make up the repeating backbone of the protein, rather than the variable side-chains that differentiate its amino-acid subunits. The large number of local interactions involved leads to a stiffening of each hydrogen bond, which gives rise to what physicists refer to as 'a cooperative shear geometry'. "This kind of structure can withstand extreme stresses, because all of the individual bonds must be broken at once in order to separate the complex," as Lukas Milles explains. The mechanism is analogous to the interaction between the many tiny hooks and loops on two Velcro strips, which are extremely difficult to separate when pulled from opposite ends. "The bacterium makes use of a very unusual mechanism, which is both extremely intricate and highly effective, and endows the pathogen with a decisive advantage," says Gaub. Since the mechanism is based on the peptide backbones of the interacting molecules, which is common to all proteins, this level of stability can be achieved in interactions with a broad spectrum of targets. In other words, the extremely high mechanical strength of the interaction is largely independent of both the amino-acid sequence of the adhesion protein and the biochemical properties of the target peptide. Staphylococci are responsible for a wide range of infections in animals and in humans. 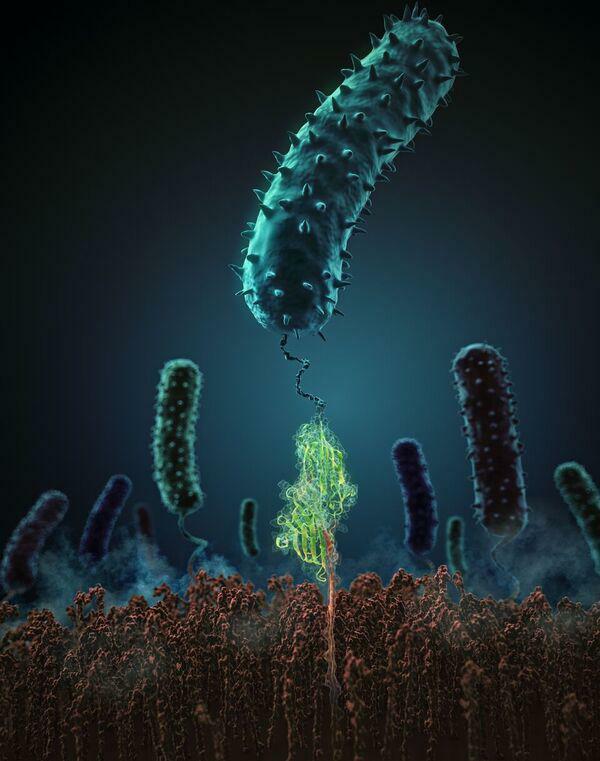 "Pathogenic bacteria bind to target molecules on host cells with unusual persistence, and this has its basis in physical principles. In the search for ways to block invasive infections, a better understanding of the physical principles involved is vital," says Hermann Gaub. Thus, the new study lays the foundation for the development of novel therapies for the treatment of staphylococcal infections.